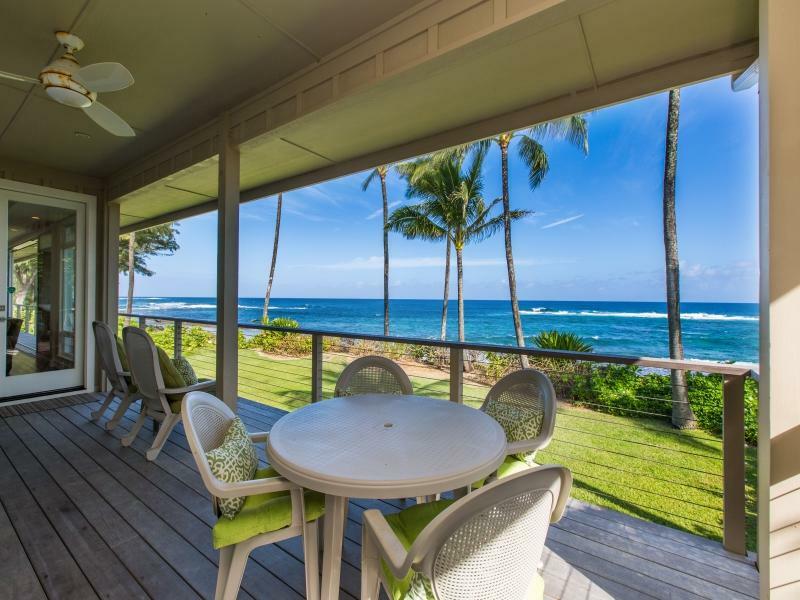 Elegant and spacious King Hale, set beachfront in a lush tropical jungle, is located in the serene community of Haena, just four miles north of Hanalei. 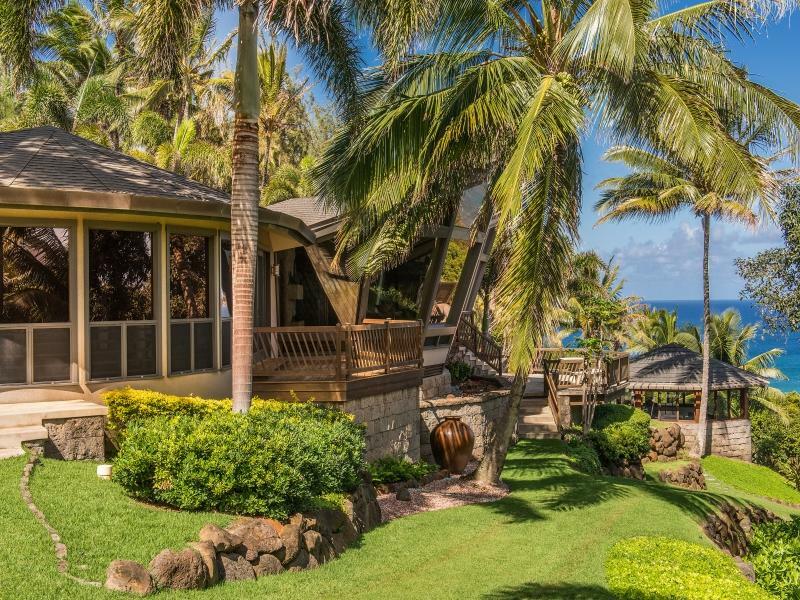 Here you will discover beautiful stretches of white sand beaches and the most breathtaking of sunsets. 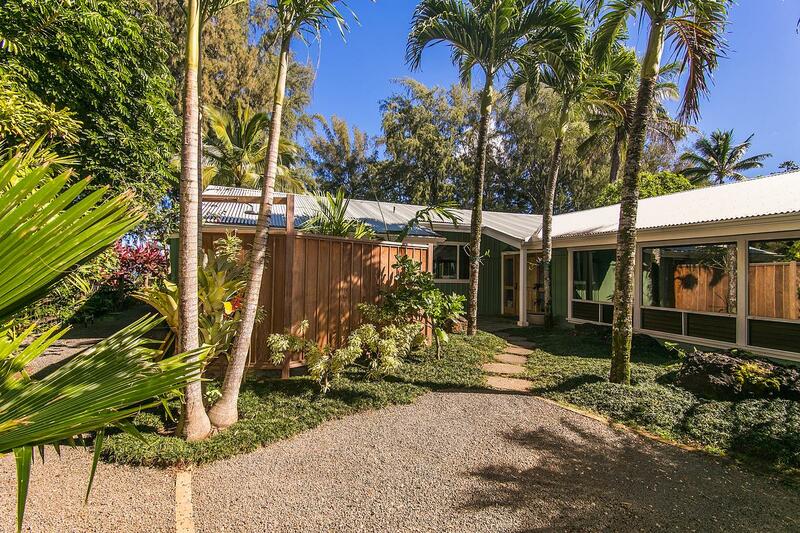 This four bed, four bath home is built around an elevated open floor plan that is ideal for family gatherings or gracious entertaining. 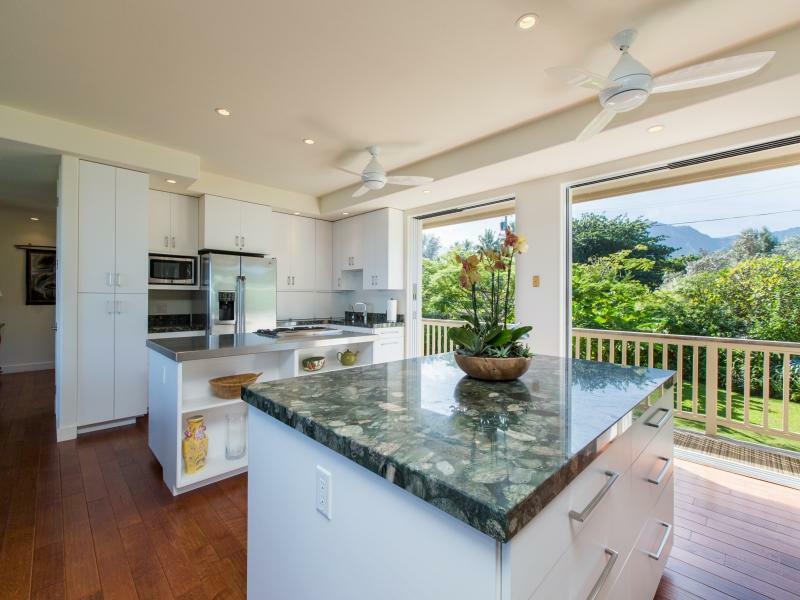 The fully-equipped gourmet kitchen with top-of-the-line appliances and granite countertops is perfect for intimate meals or large dinner parties. 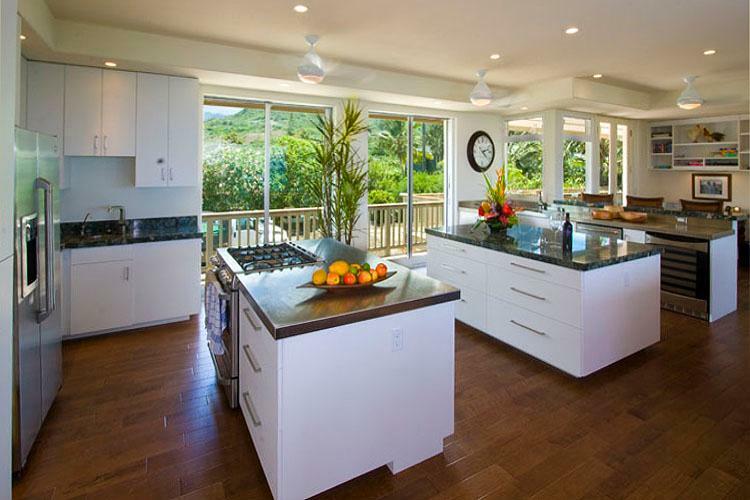 In the nook off the kitchen, a round dining table with seating for 8 overlooks the blue Pacific Ocean. 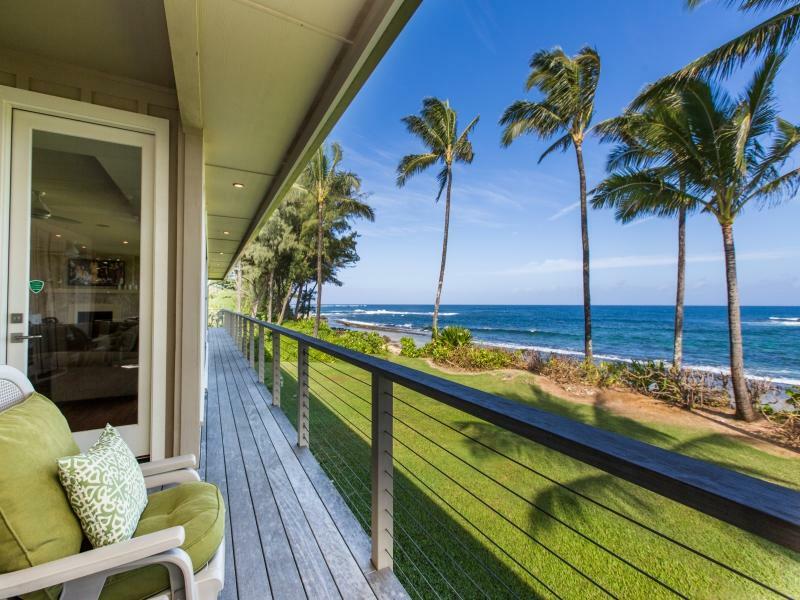 Oversized sliding doors to the lanai allow for seamless indoor/outdoor living and capture the gentle tradewinds blowing in off the sea. 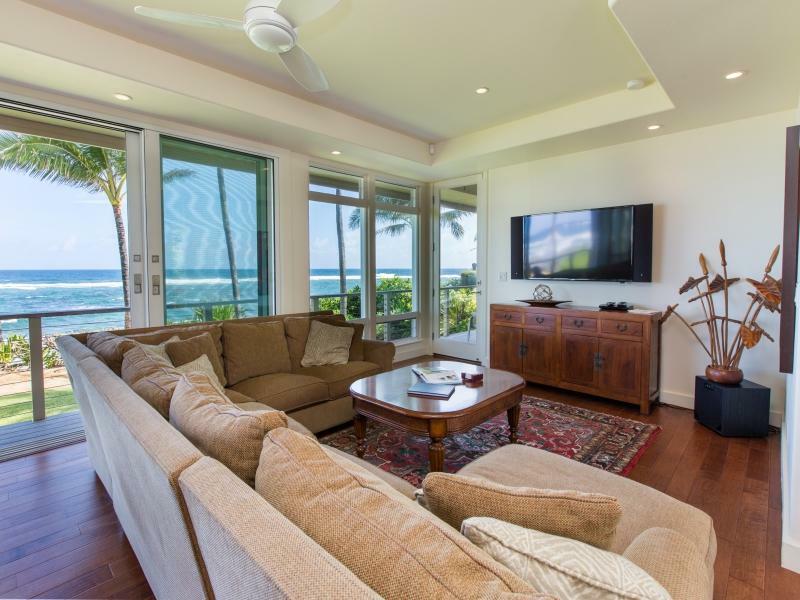 The living room has two large separate seating areas, a wall mounted flat screen television, a fireplace, and floor to ceiling windows that illuminate the tropical garden and beach beyond. 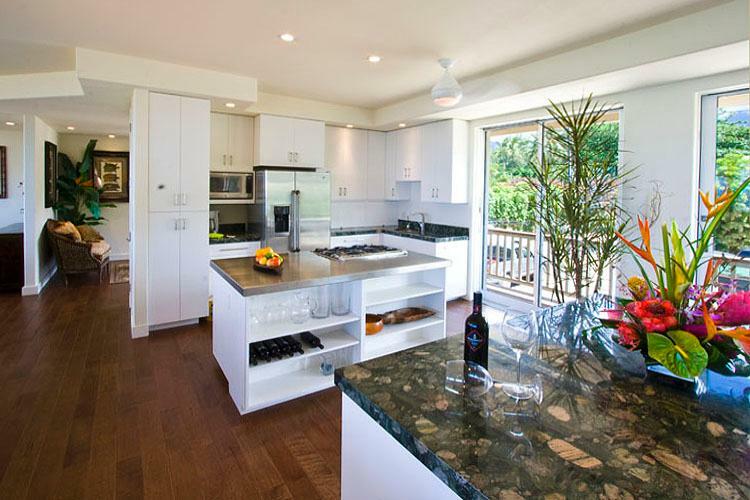 Electronic amenities include DVD/CD players, Satellite TV, Wireless High Speed Internet, and iPod docking stations. 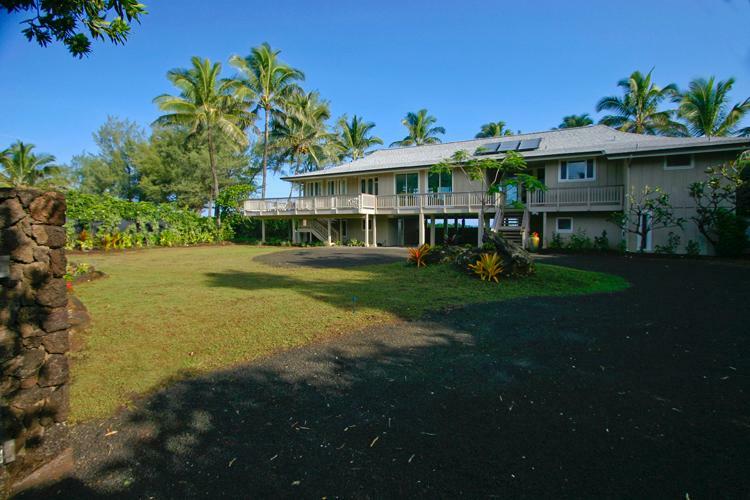 There are 3 bedrooms on the main upper floor of the home. 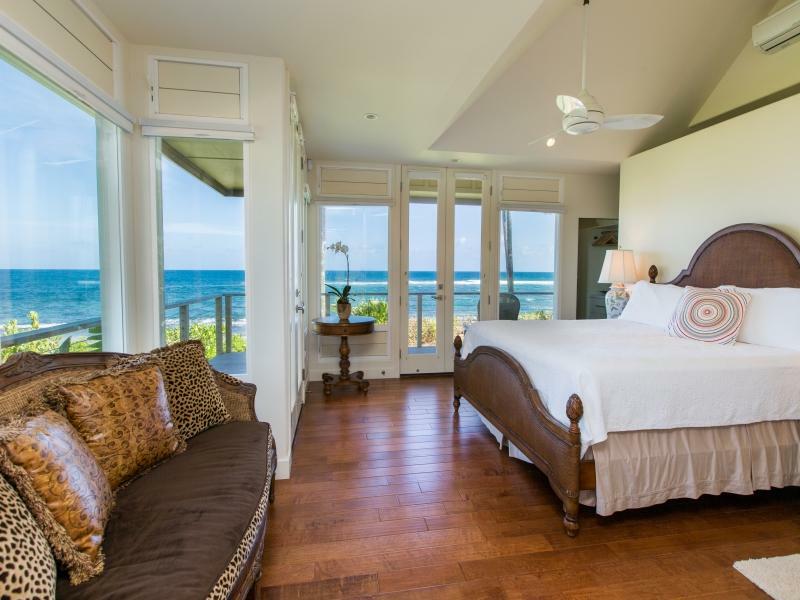 Two of the rooms are master suites with King beds, flat screen tvs, ocean views, and air conditioning. 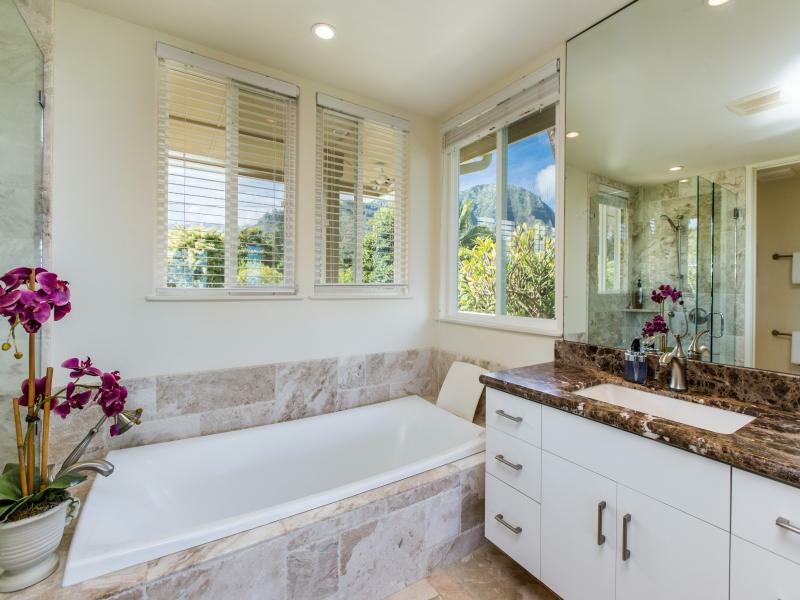 Both have en suite bathrooms that feature large walk-in showers and soaking tubs. 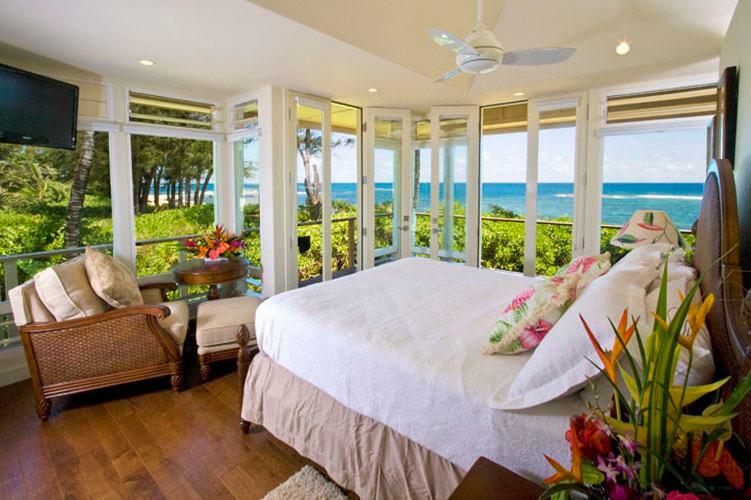 The 3rd guest room has a Queen bed, ocean views, and air conditioning. 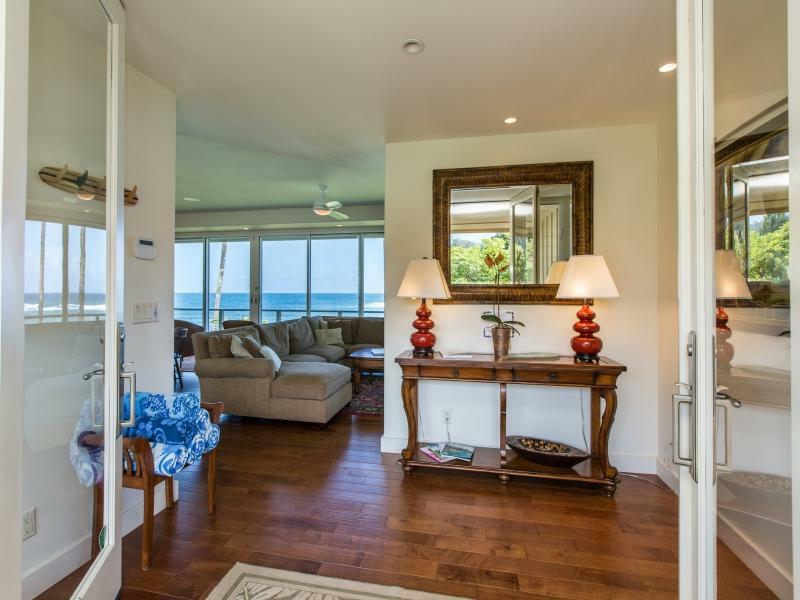 All rooms have large windows and French doors that lead to ocean view lanais. 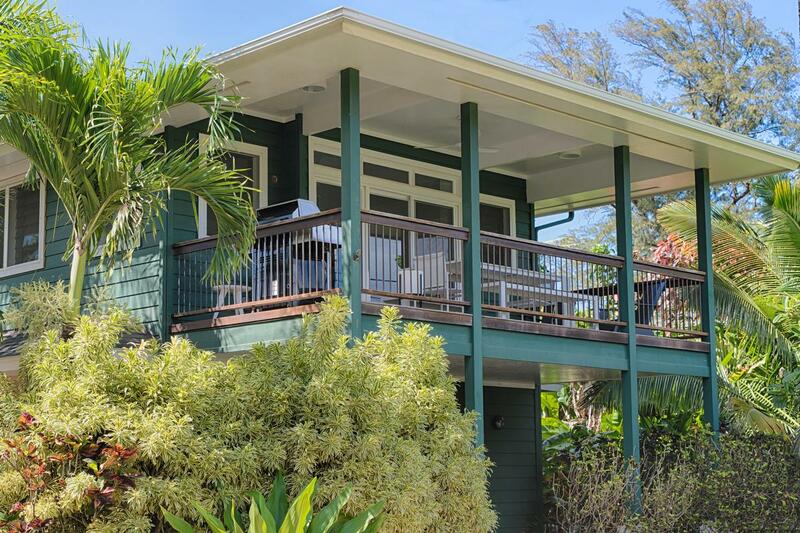 The ground floor guest suite has its own separate entrance, King bedroom, bathroom and living area with sofa sleeper (there is no air conditioning in lower bedroom). 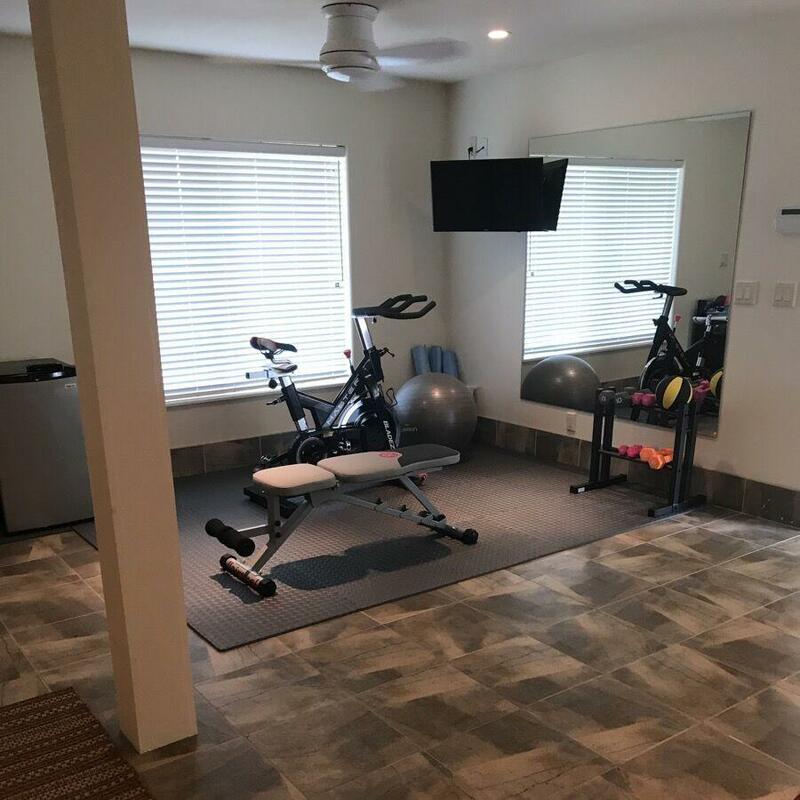 Gym equipment is also available at the house, including a spin bike, bench, free weights, and yoga gear.